Good morning sweet friends! So I had a little adventure. My sister flew in and we took to the road. We banned work, donned our sandals and headed out along the sugar white sands of Florida Gulf Coast with no particular place to go. I guess I’ve been a hermit over the years because what was once woods along the road has sprung up in to tiny hamlet after tiny hamlet. How does a new little city just pop up? One of the little shops that we stopped in was a dress designers boutique that made ‘one of a kind’ creations.It wasn’t what they made that caught my eye but it was the feeling in the air that I found surprising and delightful. Her clothes were creations that were ripped and torn into assembly and occupied the far end of the spectrum from ‘tailored’. Sometimes there was wire involved, there was even a dress covered with keys. The prices were unabashedly in the hundreds of dollars. As the designer and several helpers were working, they were totally invested in what they were doing. Their confidence was though the roof and their projection of that confidence was unmistakable. They were standing there ripping up fabric to make clothes and it was the most normal thing in the world at that particular moment. It was clear that they were living their art and not concerned about what anyone thinks or waiting for anyone’s permission . . . hold that thought. This card is up for grabs today to one of my sweet readers. Every Friday, I give away a card to a randomly picked reader who leaves a comment in our conversation. Want to know more about Day of Giving, here’s a link to my FAQ’s just check out #11. I wanted to say that each of you are artists every time you sit down to create a card. You never need to worry about what anyone thinks nor if your creation is good enough. Trust me, it is. For your comment today – How does the act of giving heartfelt and handmade creations boost your confidence as an artist? Accessories: Spellbinders Filigree Side Pocket, Spellbinders Victorian Reverent Square, Satin Ribbon – The Paper Source, Recollections Pearls Thanks for stopping by :-) For those who are waiting, I’m all caught up on mail and all claimed Day of Giving Friday cards have been mailed. Oh I love your card!! and soon I can make something similar..I just ordered all your new dies!! I can’t wait! thanks for sharing and maybe I will get lucky this time and win this one!! WOW another stunner here again today Becca. Such a wonderful card, that just express elegance at it´s best. I absolutely love it. The card is beautiful but it’s what you wrote about the dress making shop that made me smile, I am a displaced Californian, now living in Missouri. ..what you described is a feeling I used to have in San Francisco and Sausalito watching the artisans go about their pottery, paintings etc. What a lovely card and such a beautiful sentiment too. I was lucky to be able to pick up a couple of your Wedding Collection’ dies at a craft show in Alexandra Palace where there is a spectacular view over London. I can’t wait to plat soon. When I give a handmade card to friends they know I have made just for them. I box them in clear boxes and add a bow and flowers. It’s wonderful to see joy and delight in their faces. I love the sentiment. Just beautiful! How fun to have your sister visiting and that you can just go play tourist. That is a lovely card. My beautiful niece went to heaven 12 years ago at the young age of 25. This week we should have celebrated her 37th birthday. To the family, she was and still is truly an a angel. p.s I live on the Gulf Coast of Florida..a true beauty in itself! Yet another beautiful card Becca. It’s so nice that you were able to spend some quality time with your sister. I have been told that my friends and family look forward to receiving a card from me to see what creation I have come up with this time. That’s reward enough for me. For me its not only the act of giving my cards but more so the reaction of the receiver. Nothing more rew a rding than see the expression on their faces and the compliments they express. Thats my biggest boost. Ahhh, very pretty card, and one of my favorite Quietfire stamps…of course I say that about a lot of them! Creating something unique for someone and then giving it to them, watching their face as they see it for the first time…that first awww, or giggle, or Wow! It is the perfect confidence booster, but that isn’t what seals it for me as an artist. It is all about the love when I am making something specific for someone…the “Judy” card, or the “Jan” card…watching it take shape, picking the right colors, and sentiments, etc. just the joy of creating…making something new…sharing it, whether someone loves it or not. That’s the artist part. Beautiful card, beautiful sentiment Becca!!!! Would love to win it! I began crafting after retirement by taking pictures and making them into cards because people wanted to buy them – 300 in the collection. I have moved on to hand crafted cards (after walking into a stamp store in 2009), but still get calls for the picture cards. Several years ago, my nurse friend in Florida ordered some of the picture cards to send out; last week she called and told me she sent my ‘Peter’s Red Canoe’ to her Pastor – named Peter and in treatment for cancer. She wrote a fanciful note about Peter’s red canoe relating it to him…he later told her how personal the card was and how much he treasured it. Needless to say, I was touched too that the picture I took so long ago could still be a blessing. It was wonderful to know that even my beginning crafting touched someone in a special way and encouraged them in a difficult time. We never really know how much our artistry touches others! What a gorgeous card Becca! Love the gold and white, and of course your beautiful bow. Wish I could make bows like you do. What a fabulous card, Becca. I love all of that filagree!!! It just makes my lacy heart smile! It is especially pleasing when the recipient of one of my cards tells me how much they like and appreaciate it. Makes me feel that all the love and effort I have put into making it has been worthwhile. I love your beautiful works of art and this cards is another winner! I just purchased three of your dies and am anxiously awaiting for them to arrive to see what I can create with them. You are an awesome inspiration!! I feel happy when i make cards for my lovely family and they know it is made with love just for them. Oh Becca…one more gorgeous card. I love your new die, so elegant. I just might need to purchase your die sets. I SUPPOSE THE CONFIDENCE COMES FROM ALL OF THE PRACTICE. I HAVE BEEN MAKING AND SENDING CARDS FOR OVER 16 YEARS, AND I MUST ADMIT THE FIRST FEW YEARS OF ATTEMPTS WERE AT A VERY NOVICE LEVEL. I AM CONSTANTLY LEARNING AS I FOLLOW THE CARD MAKING EXPERTS LIKE YOU, BECCA. AND, OF COURSE, THE FEEDBACK I GET FROM THE RECIPIENTS ALSO BOOSTS MY CONFIDENCE. Your road trip sounds like it’s jumped started your motor….nothing like a good time with your sister. I love to hear my friends tell me how a card that I’ve given them in a batch made their friends smile. It makes me want to give them an endless supply…and I have with my BFF. Your little hamlets popping up around you are the direct result of the winters up north. They just keep coming!! Our landscape is in constant expansion. I love giving cards. I made one for my husband’s co-workers and it turned out so pretty. I can’t wait for them to open it. It does make you feel like an artist. What part of Florida did you visit? We live in Jacksonville Beach, FL. I hope you had a lot of fun with your sister. You have showcased a favorite stamp with this beautiful card, Miss Becca. I frequently use this Eskimo proverb as the sentiment on sympathy cards as it seems sensitive and meaningful in most cases. This card is beautiful. So glad you and your Sis had such a nice reunion. Good for the soul!! Your question for the day- when someone tells you they are never going to throw a card you made them, it sure makes my heart sing! This is so rewarding to me and it makes me want to continue making and giving cards to “special” people. Thanks for all you do for us and God Bless. I loved your story about your visit with your sister. If we listen, the Lord gives us important messages. Sounds like this was true for you…and what a delightful way to receive it. Sometimes the card I’m not thrilled with is someone else’s favorite. The gratifying thing about sharing my art is that my creations have been an enjoyment and blessing to many others. Focusing on doing the best I can applies in making art and living life. So glad you got to spend some quality time with your sister. Last week I went on an adventure with my niece to visit my brother in Kentucky. It took us 16 hours to drive there from Long Island, NY and my other brother drove up from Florida. It was so much fun to get together and just laugh and enjoy each other’s company. I know that you felt the same with your sister. I actually brought a card that I had made for my brothers birthday and everyone loved it. His gratitude inspired me to make an even better card for my niece this week for her birthday. Can’t wait for her to open it! Thanks for your generosity and inspiration Becca! -How does the act of giving heartfelt and handmade creations boost your confidence as an artist? This is another masterpiece Becca I love it. So pleased that you and your sister have had a ball! How lovely! 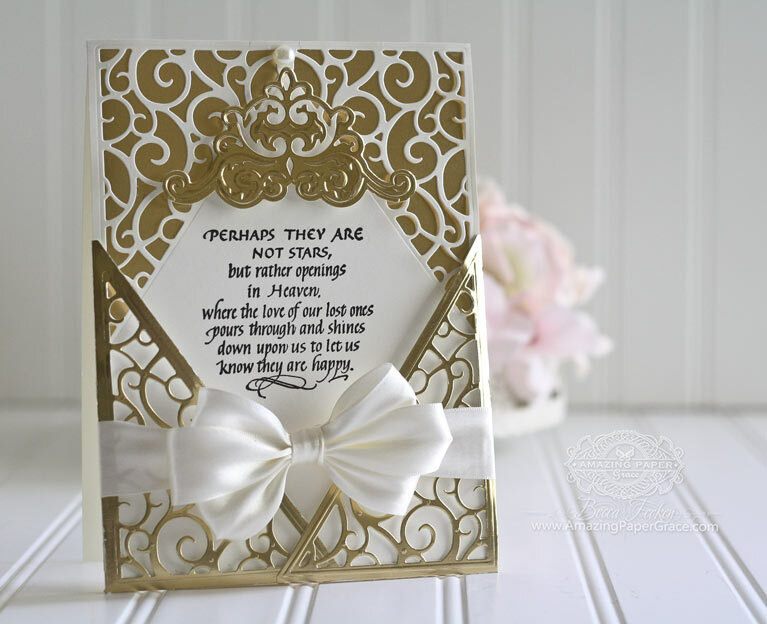 What an elegant card with all the swirls and that wonderful sentiment. I’ve been using your Cascading Grace die today, cutting card blanks and then using different colours as backing. Each of the cards looks beautiful. Thank you so much for your stunning designs. I never think of myself as an artist! I think my old art teacher at School would be turning in her grave to think that I was running a class! But, hopefully, recipients appreciate the thought, time and effort that goes into each creation. Our youngest was asked by a young man if he had offended me in some way as he had been sent a ‘shop bought’ card for his birthday! I’d just run out of time to make one and get it in the post. So glad you had a wonderful trip, that shop sounds amazing. Giving a handmade card to someone is very rewarding especially when they appreciate it, I know I am learning more each day and getting better all the time. Most of my cards are made for missionaries & I receive thoughtful comments from them.They appreciate anything I send them because they receive very little mail & it makes me feel good that I can give them a minute of pleasure. I love your cards & it gives me pleasure to see them. Hi Becca your card and saying is just lovely today and so glad you and your sister had such h a good time together. Good morning Becca, beautiful card as usual!!! It’s good to get away and have fun and with your sister in Florida you lucky lady!!! I never thought of myself as an artist!!! Love the way you use gold in so many of your cards. They have such a regal look to them. My favorite saying in the world. 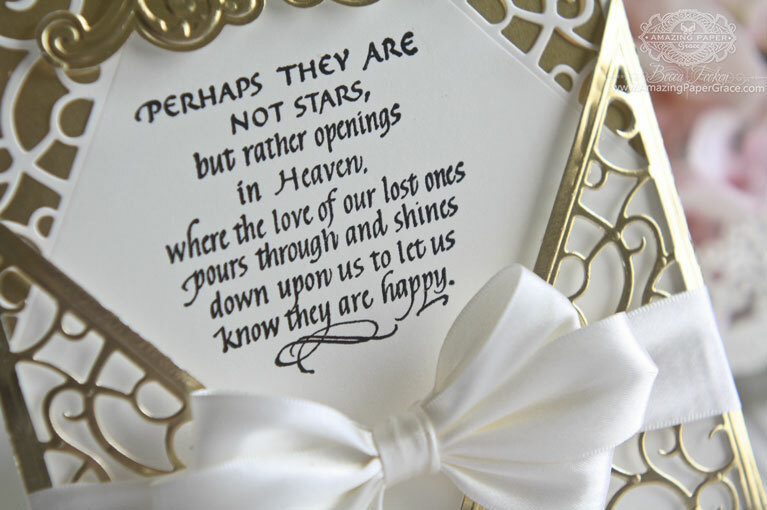 It makes me happy to think of the love of my dear ones who have gone home to God. 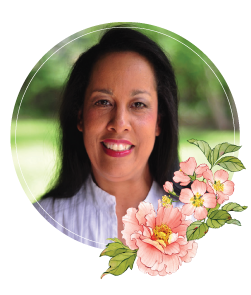 Beautiful card…I just lost my best friend of 40 years after a 2 year battle with Cancer. This card speaks volumes to me. Thank you for sharing your incredible , beautifully crafted work, tips and techniques. Also, do you give classes during the year and if so, where? Oh Becca, we are in Florida as well helping out with my Mom who is in decline. I look at her in both amazement and fear, but each day there is a praise GOD in the midst of the craziness. Hi Becca, Another stunning card, gorgeous, gorgeous, die-cuts and a fabulous sentiment. I think we are our own worst critics where our cards are concerned, I know that I am. I feel a sense of pride when I create a card that I love and hopefully the recipient will love too. Let’s face it, it takes us (well me anyway haha) a long time to think of and complete a card for someone, and it is wondrous when the recipient loves it. So glad you have had a good time with your Sister. Hi Becca, a gorgeous card and can’t get any of your collection till we get home (in Australia at the moment) but been checking the blogs and Julia Watt has been using your wedding collection which we saw on your blog a while back so looking forward to getting home to purchase them. Made a lot of things to bring out for my granddaughter and friends here and a great feeling when they rave about them to friends and family. This card is so elegant and beautiful. I love all the filagree in the dies and the sentiment is lovely. When I give something i have handcrafted, it always boosts my confidence but I also know not everyone appreciates something handcrafted so I try hard not to let someone’s reaction define me as a crafter. I love it when I see expressions of delight or pick up the phone to hear heartfelt gratitude but I’ve also been in situations where the recipient doesn’t acknowledge that the card was one I handcrafted. After my Dad passed away two years ago, I wanted to find the last card I made him for Father’s Day but I haven’t been able to find it . At first, I thought he must have thrown it away and that thought hurt a lot. I decided that it was so special to my Dad that he put it somewhere special. I don’t know if that’s true but I choose to believe it because I love my Dad and know he loved me. I made a choice not to let the missing card mean anything negative so it can’t hurt my confidence. Becca, Thank you so much for sharing your talent. I won on my hubby’s birthday and received my beautiful card the day after my birthday! Becca, who makes the metallic poster board that you use? I have heavy gold and silver card stock but the edges don’t look right because it has a white cord.